Green is a wonderfully fresh color to use for a wedding. You might not think that it would be easy to find beautiful flowers in a green hue, but there are actually quite a few gorgeous green options for wedding bouquets and centerpieces. This is a guide to help you select the most incredible green flowers for your wedding. All green wedding bouquets and centerpieces are fresh and exciting, and many of the flowers on this list lend themselves to taking center stage in an entirely green arrangement. If you want just a touch of green, it combines wonderfully with almost any color, especially pink, purple, blue, and white. A green based bouquet or centerpiece can also be layered with a dark rich color on the base, such an espresso brown ribbon on a bouquet or a deep bronze vase for a centerpiece. 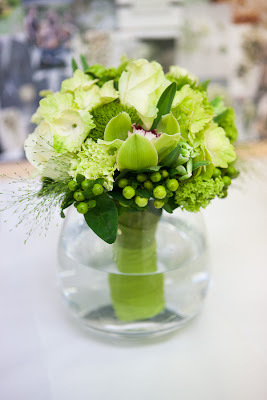 One of the favorite green wedding flowers would have to be the hydrangea. The tightly clustered full blossoms of this summer classic make the hydrangea a very versatile choice for almost any style of wedding. 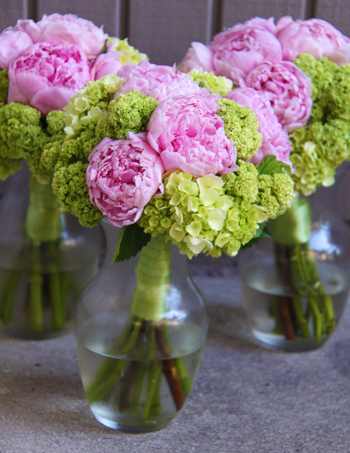 For a preppy wedding, pair green hydrangea with pink ones, or mix the green blooms with other pink flowers like peonies. Don't forget to wrap it all up with a pink and green grosgrain striped ribbon and custom sets of pink and green bridesmaid jewelry for your attendants! For an extremely elegant effect, green orchids are ideal. Cymbidium orchids are available in a fabulous lime green, either all one color or with a contrasting spotted lip. Lady slipper orchids come in a lovely soft green shade, and glamorous dendrobium orchids can be found in a bright green. The green orchids work marvelously in submerged flower centerpieces, as well as for the wedding bouquets. There are other green flowers that can also be a wonderful addition to a wedding, especially as part of mixed flower arrangements. Cheerful lime green button poms or zinnias add a great texture and pop of color to bright orange or hot pink bouquets. Green can be more subtle, such as the pale green hue of certain lisyanthus or tall graceful gladioli. "Green envy" echinacea flowers are a lovely choice to include in a bouquet of purple wildflowers. Finally, don't forget about some of the little extras. Of course, there is the usual green ivy, but there are less commonly used greens available, such as velvety greenish-gray lamb's ear, scented geranium leaves, and large variegated hosta leaves. Whether you choose all-green bouquets or prefer to use green as an accent color, one thing is certain: green is a fresh and exciting color to include in your wedding flowers.